Do you want to train your whole body and make the most of your workouts? 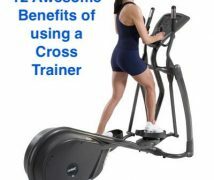 Choosing the best cross trainer might just be the thing you need. 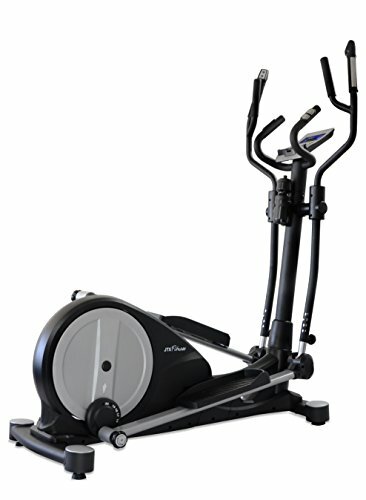 An elliptical trainer is great for working out all your muscles at once. That’s because you’re using your legs to pedal, your core to keep your balance, and your upper body moves at the same pace with your legs. That’s a great low-impact workout in the privacy of your own home, and it’s also great for cold or rainy weather. If you’re in a rush, here is a table with the products we’ll analyse in this article. Further down you can read about the things you need to consider before buying and read each individual cross trainer review. This is the top factor to consider, particularly because it influences all the others, as well as your overall budget. So, if you want to train on a machine that does similar stuff as the one you’d find in a gym, be ready to spend over £500. 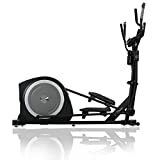 But there are tons of decent elliptical trainers at a very affordable price that help you get toned and lose weight. 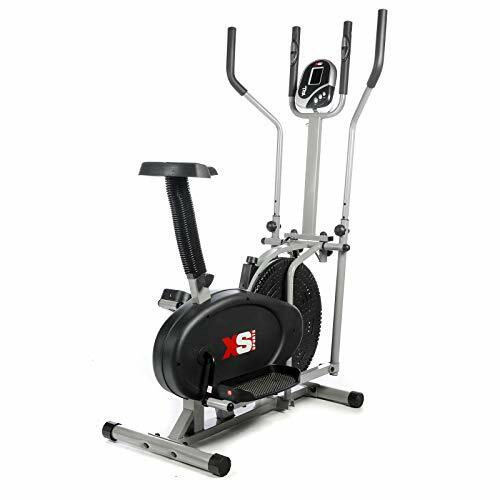 You can buy one for as low as £100, the cheaper ones usually come in a 2in1 combination, so you can use it as an exercise bike as well. But for a better core and lower body workout, you’ll have to look for an inclined angle capability or extra resistance. To get a better idea of how many calories you’re burning, you’ll need accurate heart rate measurements or even an included chest strap. You won’t find these features in a cheap cross trainer. The materials used are really important, these will tell you how sturdy the cross trainer is. For instance, steel is really robust, but it adds to the overall weight of the machine. That means it offers increased stability, though you can’t move it around the house quite that easy. Make sure you check the overall dimensions before making a purchase, so you’ll know if you have space for it. Other than that, look for a heavy, big flywheel for extra smoothness and stability. The foot pads should also be comfortable, just like the chair. This is an essential feature in choosing a good machine. More programs allow you to customize your workouts better and get great results in no-time. However, make sure you understand exactly what each program does and if it fits your purposes. Each trainer has various magnetic resistance levels, meaning you can adjust the level of difficulty. A long stride also contributes to added resistance, so your muscles have to work harder. That’s great if you want better toning results. Considering plenty of us want a cross trainer to lose weight, it’s essential to check this feature. In fact, we’d advise you to check this one first, so you can get it out of the way and not lose time falling in love with a machine you can’t use. Take into account the fact that you’ll also be wearing gym equipment and that your weight fluctuates throughout the day. 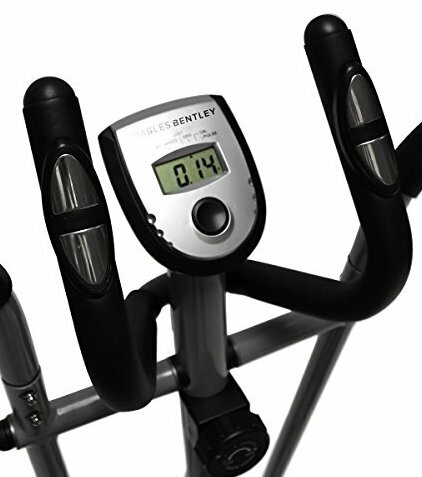 So if you’re very near the max weight limit for a specific cross trainer, you’d better choose one with a higher one. Warranties are a guarantee of quality and the included extras show that the company is interested in user experience. Just remember that there are different sorts of warranties: for the frame or for other in-home repairs. In terms of the extras, you can get stuff like an HR strap for monitoring your heart rate more precisely, access to a free fitness app for more motivation or even a floor mat. These shouldn’t be deal breakers, though, unless they’re essential for your purpose. For example, an HR strap might be for people who want to make their weight loss process extremely mathematical. 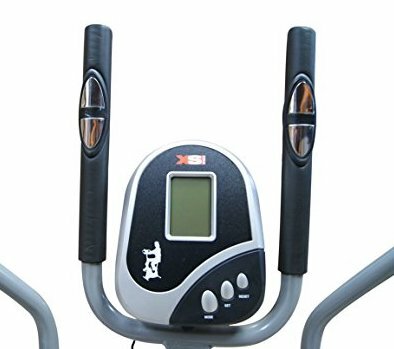 The XS Sports Pro is one of the cheapest cross trainer you can find. Although it has a steel frame, it’s a lightweight machine. However, the maximum allowed weight for the user is 110 kg, while your foot size can’t be more than a UK size 12. A disadvantage here is that you need to spend some time with its assembly. The instructions aren’t extremely detailed, so you need a degree of DIY know-how. 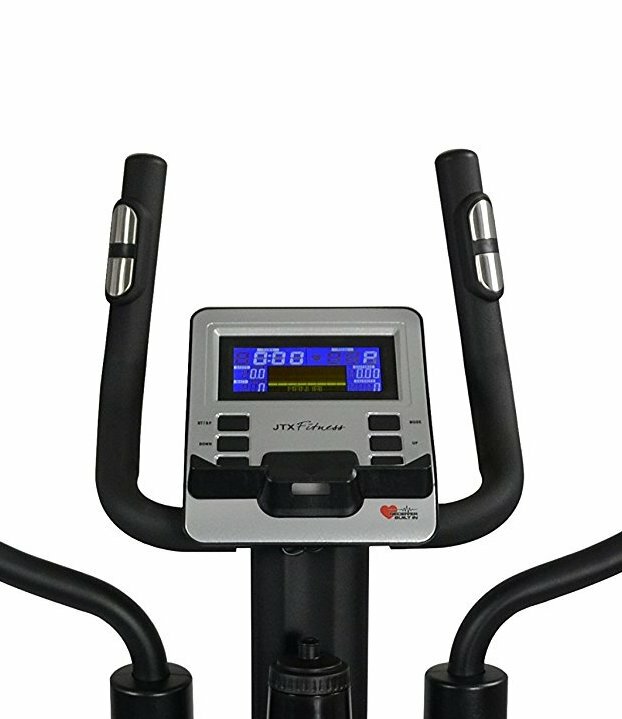 With its 2in1 construction, it can also be used as an indoor bike, and the cross trainer functions work decent. You can measure your heart rate thanks to its accurate pulse sensors and adjust the workout accordingly. We love the front flywheel that’s great for extra stability, and the adjustable resistance can turn your workouts into high impact too. The LCD display is easy to read, while the wide platform pedals are comfortable enough. However, this machine is a bit noisy once you use it for some time – nothing some noise-canceling headphones can’t take care of, though. You can work out your entire body, and the dual direction both forward and back is great. 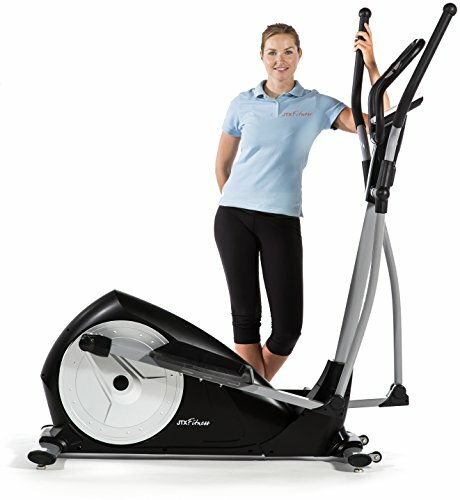 Besides, this machine actually mimics the way your body moves when you’re walking, and that’s great for toning purposes. 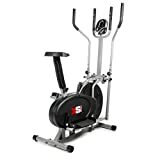 The Charles Bentley Elliptical Cross Trainer is another affordable cross trainer on the market, with features that make it stand out compared to its XS Sports counterpart. 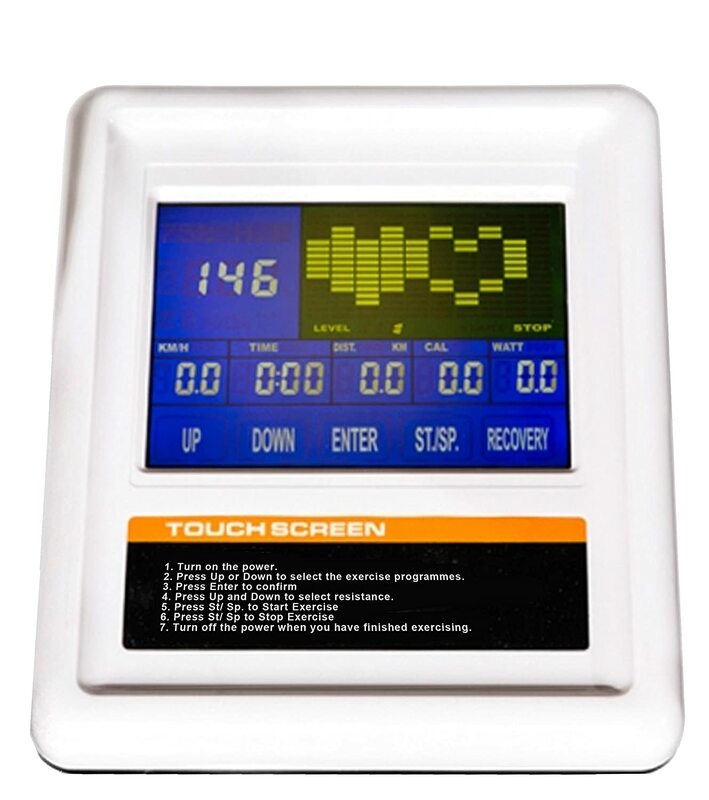 You can use this for low impact workouts, with all the basic measurements provided on its easy-to-read LCD display. So you’ll be reading the time, speed, distance, along with your calories and pulse, to understand how hard you’re working and eventually how to achieve better fitness results. The 8 levels of magnetic resistance aren’t as much as that of other items reviewed below, but it’s a fairly decent number to increase or decrease the impact of your workouts. The 4 kg flywheel offers good stability too, though other heavier flywheels can be considered better. Either way, we love the accurate handlebar heart rate sensors and the good grip provided by the non-slip feet. Its total weight is on the light side, but it’s probably because of the steel and plastic construction that isn’t as sturdy as a full steel build. It also needs some assembly, though you’ll get great instructions for that. The 100 kg maximum user weight could have been improved, so a heavier built guy or gal can’t use it for achieving their weight loss goals. 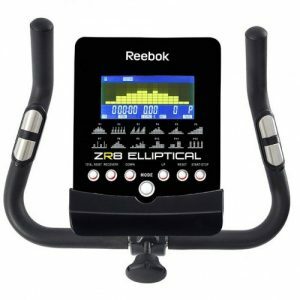 In the mid-range price pool, The Reebok ZR8 is one of the best cross trainers for people who are interested in a basic total body workout without having to go to the gym. And this machine is quite close to the ones you’d find in a gym, though it does have its critics. For instance, you can’t go uphill with it, in the sense that there’s no height adjustment to mimic an incline. However, it does have 32 different resistance levels, more than some of its pricier JTX peers. Besides, it offers both the forward and backward pedal movements, and that means you can work different muscles and adjust your workout level. We love the 12 preset programmes for better workout customization and increased user experience. Still, the instructions aren’t that detailed and you’ll mostly have to figure out on your own what each programme does. You’ll also have to spend some time with the assembly. Its overall weight is quite big, so you can’t move it around your home very easily, though that means it’s a stable machine. The large flywheel is another plus though, it contributes to the increased stability and accounts for a smooth motion. The foot plates are also really comfortable and they’re also adjustable. 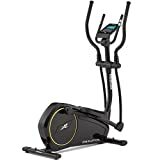 In the world of best elliptical trainers, this one definitely wins the jackpot in terms of price and features with so many things we love about it. 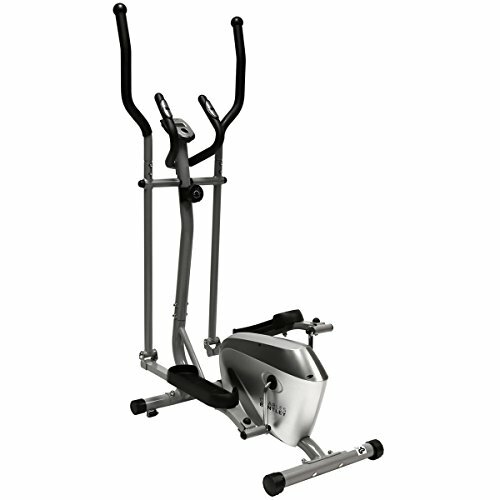 Its steel frame screams resistance and stability, though it’s not the lightest in the market. That’s probably why it has a 5-year warranty. Conversely, the in-home repair warranty is 2 years, which is still a lot. Its large console is easy to read, and the touchscreen works fast just like the start buttons. With its non-slip pedals and floor pads, you’ll definitely have a secure grip and you can work your magic, provided you weigh less than 110 kg. This piece of machinery is great for backcountry-skiing training since it offers you low impact training for the whole body, just like skiing does. With its 21 programs and 16 levels of magnetic resistance, you can control things from your heart rate to the angle and how much fat you’re burning. Yes, you actually get both body fat and pulse measurements, and the 16-inch stride can make you work harder. 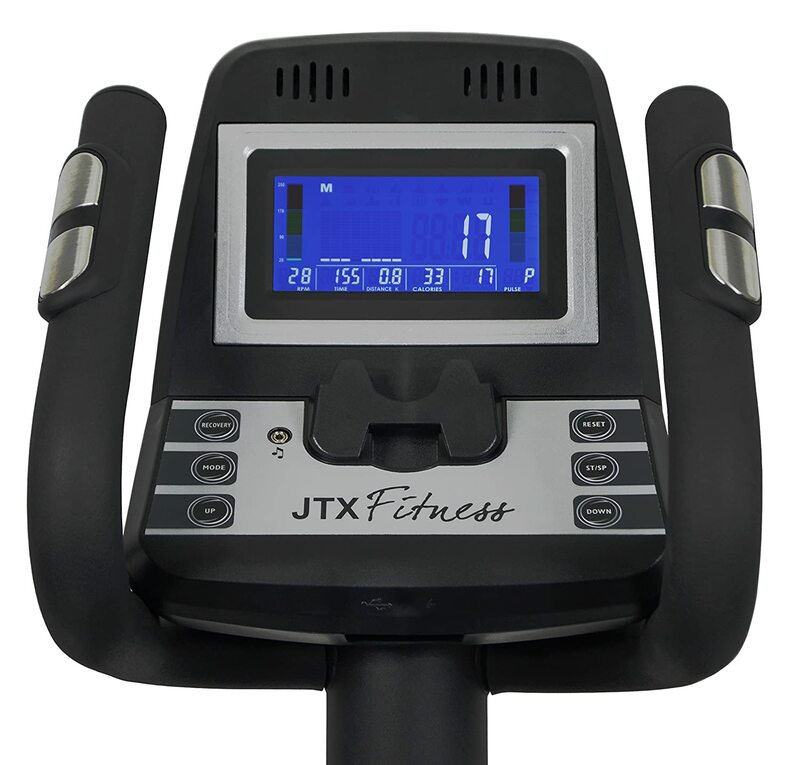 This JTX Cross Trainer might be the best home cross trainer you can get if your purpose is losing weight and training your lower body very well. That’s because you get a very strong electromagnetic resistance, as well as the ability to control the incline so you can give your core and gluteal muscles a better workout. And let’s not forget that it has an adjustable stride length, which can get fairly long and contributes to the added resistance. So you can adjust all these dimensions to increase or decrease the level of difficulty, but you also have heart rate programs plus an included heart rate strap to customize your workout minutely. And the fact that you can connect it to an iConsole app is amazing in terms of motivation. Plus, you can use any Apple or Android-using phone or tablet. The dimensions are quite compact to reduce the space taken in your home, while the handlebars are extremely ergonomic since they offer multiple grip points and a bio-mechanic design. Besides, you can use this machine if you weigh less than 135 kg, so that’s more than the previous products we reviewed here. We also appreciate the lifetime warranty for the frame, as well as the 2-year warranty for home repairs. So what can be wrong with such a great fitness machine? Well, some might say it’s a tad heavy, and the price is on the expensive side of the spectrum. 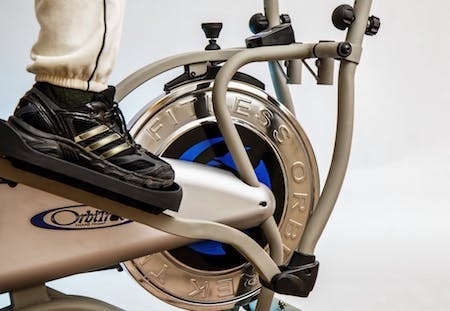 This trainer is the most expensive in our reviews, but we wanted to end up circularly. And do you believe us that this might be one of the best cross trainers ever made? With its sturdy build and a steel-made frame that’s really heavy gauge, you’ll get stability, smoothness and irksome screeching. 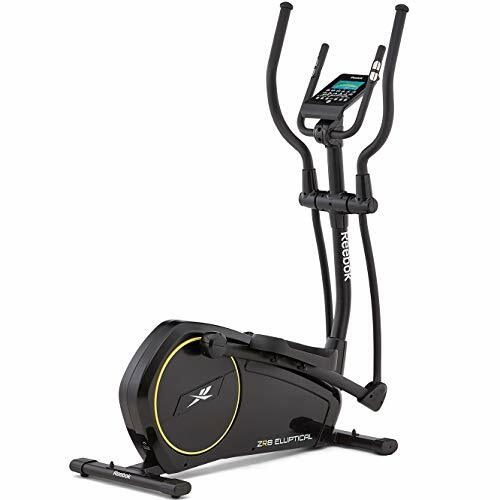 Basically, this is one of the elliptical trainers you could find in a gym, with top-notch components and a supple design, though its flywheel weighs 17 kg. The stride path is 21 inches long, so you can get a harder workout thanks to the increased resistance. There are 19 different programs to choose from, each making you sweat a little more, with all sorts of interval, sprints, fat burning or endurance workouts. You can measure your heart rate, and use the fitness app for interactive motion and increased motivation. The HR chest strap is great for making a better idea of how hard you’re working out, and the floor protection mat is a really thoughtful addition. We love the lifetime warranty for the frame, as well as the long 3-year home repair warranty that JTX has gotten us used to. Besides, you can use this machine even if you’re heavier, it supports a max user weight of 165 kg. However, its own weight is 86 kg, so you can’t move it around the house too often. Once you’re here, and you’ve read all our cross trainer reviews, you see we’ve taken you through a large selection of different machines. That, along with our first section about how to choose, should probably give you a good idea of how to pick something that works for your needs. With that in mind, we’re curious to learn a bit more about you. 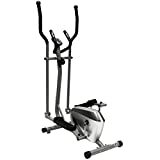 What will you use this elliptical trainer for? Which machine did you fell in love with? What did we miss in this article? Leave us a comment below.